Artificial Intelligence is allowing companies to improve customer service in ways not possible before. Chatbots allow companies to have an always-on agent that can be integrated into customer support service teams to answer questions or help provide more relevant products and services based on customer preferences. AI enabled systems can help handle complicated, multi-step transactions that are often error-prone such as loan application or student applications or real estate. AI can also provide proactive customer interaction looking for patterns and reaching out to customers who they think might be experiencing a problem. 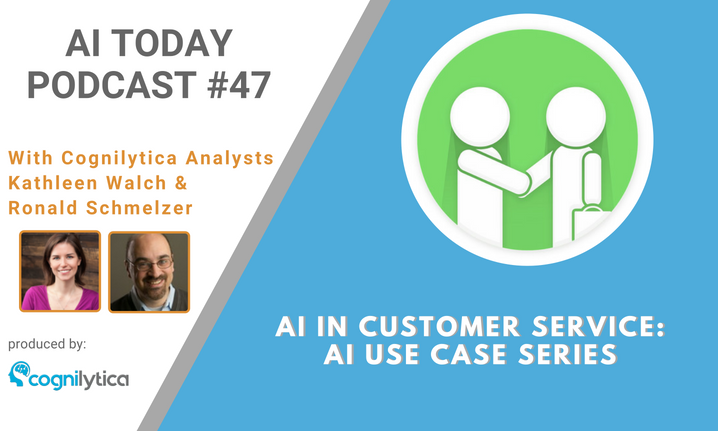 In this podcast, Cognilytica analysts Kathleen Walch and Ron Schmelzer share some of the ways in which AI is being used today and how they are transforming our lives both personally and professionally.